salt-lime-water solution (I made sure to ask several chefs in Vietnam about making banana flowers palatable). The flowers are football-shaped red-purple pods at the end of banana stalks. Under each leaf you will find tiny, immature bananas which, unfortunately, have no taste and we discard them in this recipe to keep the look more uniform. Banana flowers are imported from Mexico and I find them in produce aisles that offer Latin American or Asian products. Look for smaller ones and those that are more pale in color as dark purple leaves are tough. Banana flowers taste nothing like bananas but add a slightly tannic sensation that complements the lime, chili and salty flavors in the recipe. This salad is a refreshing counterpoint to the often sweet flavors in a Vietnamese menu. Combine all ingredients in a food processor and chop to fine, about 15 seconds. Or hand mince and combine. Toss the shrimp with the fish sauce, sugar, salt and pepper. Separate out 8 of the shrimp and roughly chop them. Heat a small fry pan over medium until hot. Coat the pan lightly with 1 teaspoon oil and add the whole shrimp. Cook, turning once, just until done, about 3 minutes. Set aside to cool. Coat the pan with the other 2 teaspoons of oil and cook the shallot until lightly brown, about 3 minutes. Add the chopped shrimp and cook stirring until just done, about 2 minutes. Set aside to cool. Have a medium bowl ready with the lime juice and salt in 4 cups of water. Discard the outer 4 or5 leaves of the banana flower. Separate the leaves by cutting them from the stem. Pull out the immature bananas from under each leaf and discard. Cut the leaves lengthwise in half and pile on top of each other for slicing. Working quickly so they don’t discolor, slice the leaves as thinly as you can and push them into the bowl of lime-salt-water. Stir them around and let soak for 15 minutes. Drain well and pat dry. Measure out about 2 cups for this recipe. Wrap any extra tightly in plastic wrap for another use such as chopped in a soup or stir fried as you would cabbage. In a large bowl toss all the salad ingredients (save half the peanuts and the whole shrimp for garnish) with the dressing. Divide salad between 4 salad plates, sprinkle with the rest of the peanuts and garnish with 2 whole shrimp each. 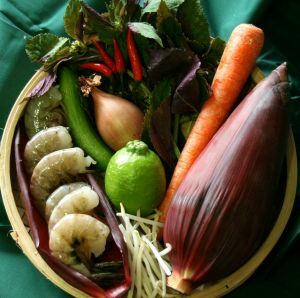 Cook’s Note: In the spring I find fresh Asian herbs in markets that also sell Banana flowers. If they aren’t available you can substitute regular fresh basil and mint, although they are stronger in flavor so cut the amount back a bit. Two different herbs is fine although the more varieties you use the more interesting the salad.